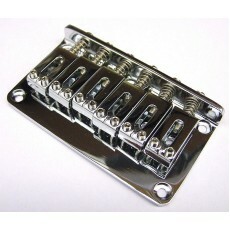 Fixed Guitar Bridge Chrome with 6 machined vintage saddles. Small footprint for hard-tail strat etc. Spring loaded adjustment. Designed as a replacement for hard tail vintage period strat and clone guitars.